The OrganicCyclist’s first sponsor! I love Luna Moons! Thank you for all of the help getting my bike ready for my journey!!! 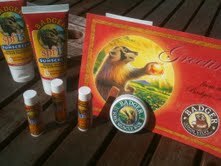 Badger Organic sun care products!!! You guys Rock!! I like your idea and would love to sponsor your trip but don’t have great cash flow to help so I came up with another idea. I custom build and sell energy savings devices motors like well pumps, irrigation pumps and chillers/compressors for cold storage equipment that are important to farms in general. I also work closely with solar contractors because my technology helps make solar more affordable. Possibly you could drop off information (a business card) to the owners if they are interested in reducing their electric bill and reducing their carbon footprint or possibly interested in solar. I could probably arrange a small sponsorship to start with and then if any business comes from it I could supplement the amount. What do you think? Emily, Thank you for your enthusiasm! I am so excited.